If you stick your hand in the air long enough, someone may just give you a high five. The 24-year-old told the NY Daily News he was walking around Manhattan one day when he saw a person with his hand in the air. He told a friend he would try to give the man a high five and pulled it off. He later decided to try to create a video about the concept. 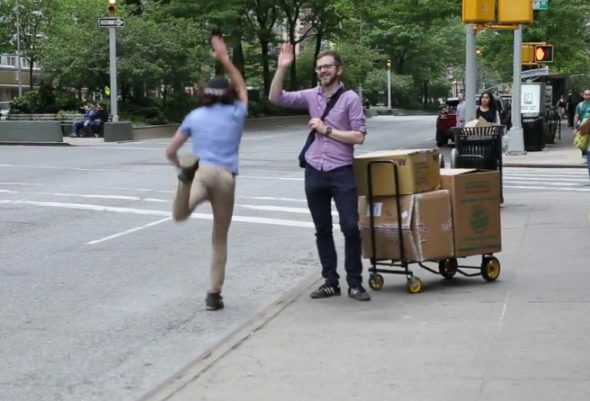 Filmmaker Meir Kalmanson, of Crown Heights, decided to spread some joy to people trying to catch a cab by high-fiving their outstretched hands. Despite New Yorkers’ tough reputation, Kalmanson said he didn’t receive any negative reactions. The Crown Heights resident, who is originally from New Haven, Conn., said he wasn’t sure how people would react at his stunt. Though he was in a joyous mood as he carried out his mischievousness, he did not look back to see peoples’ reactions. After watching the tape he was happy to see people react warmly to the well intentioned gesture – even if they initially seemed shocked for a few moments. Kalmanson even participates in a series of high fives with one man in the video who’s wearing a dark jacket and blue shirt. The filmmaker said the sequence went on for a few minutes. When the Egyptian government proudly announced plans to build a new Suez Canal last month, officials were so puffed up with pride that they took the time-honoured step of commissioning a series of stamps to mark the £2.4 billion ($3.9 billion) project. But in an embarrassing start to the plan, it appears that the stamps are not all they seem – the designers have managed to mix up their canals. Instead of featuring photographs taken only in Egypt, the stamps have been printed with pictures of the other world famous canal that runs through Panama. The centerpiece of a new Egyptian stamp touting a new-and-improved Suez Canal is actually the Panama Canal. The dual lanes of the Panama Canal are an unmistakable feature of the famed waterway. 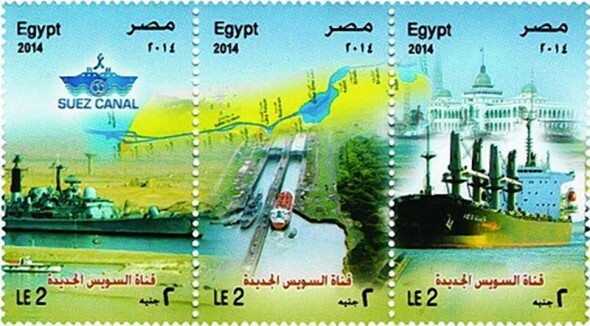 “Egypt issues stamps of “new Suez Canal”, but steals an image of the Panama Canal instead,” tweeted Amro Ali, an academic from the coastal city of Alexandria. “Major fail”. The stamps feature images of a map of the Suez Canal, along with photographs of a waterway in a desert setting which do indeed appear to come from Egypt. However they also show another two lane waterway in a green, fertile landscape which bears an uncanny resemblance to the Panama Canal – the 48 mile Central American passage which links the Atlantic and Pacific Oceans. The Suez Canal has long been an asset coveted by European empires and local Arab nationalists alike. It was once one of the gateways to the British Empire in India, but later served as the catalyst for the UK’s imperial decline after the failed attempt to retake it from Gamal Abdel Nasser in 1956. Revenues from the canal, which total around £3 billion ($4.87 billion) ever year, are now a hugely important channel of revenue for the Egyptian government. Officials in Cairo announced their plan for a 45-mile extension of the waterway last month. The plan will allow ships to travel in both directions for a section of the waterway. But engineers have already run into hot water after it emerged that thousands of Egyptians have been evicted from their homes to make way for the bypass. A government official, speaking to an Egyptian newspaper Youm 7, said that the postal service was aware of the mix up and was trying to rectify the situation. 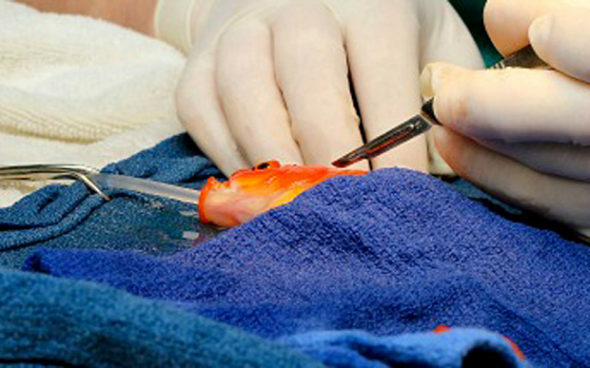 A vet has performed intricate surgery on a dying goldfish in Australia which was suffering from a life-threatening head tumour. The 10-year-old goldfish, named George, was admitted to an animal hospital in Melbourne by its owners, who were “quite attached” to the fish. Dr Tristan Rich, the vet, said the 45-minute operation on the 80-gram fish had been “quite fiddly”. He had offered the owners the option of attempting to remove the tumour or putting George to sleep; they chose the former. “The fish was having trouble eating, getting around and he was getting bullied by other fish,” said Dr Rich. During the surgery, water from George’s pond was brought in buckets and fed into a tube through his mouth to keep his gills wet. The fish was operated while under general anaesthetic, which was achieved by putting George in buckets of water laced with anaesthetic. Lyn Orton, one of the fish’s owners, said she could not bear to see George suffer. “We love pulling up a chair and just sitting next to the pond, it’s so relaxing just to watch them,” Ms Orton told Melbourne’s Herald Sun newspaper. From The NY Daily News and London’s Daily Telegraph.